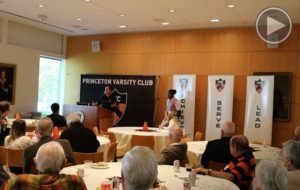 The Princeton Varsity Club held its Fall Coaches Luncheon on October 18th, where a selection of fall head coaches and accompanying student-athletes gathered to speak with university and community partners. Those teams in attendance included field hockey, football and men and women’s cross country. Each featured head coach, including Bob Surace ’90 (football), Jason Vigilante (men’s cross country) and Princeton first-year coaches Brad Hunt (women’s cross country) and Carla Tagliente (field hockey) highlighted their respective 2016 squads, provided updates on their fall season to date and spoke to their program’s role in Princeton Athletic Department’s core values of Achieve, Serve and Lead. Video highlights featuring the student-athlete speakers can be viewed by clicking here. A complete photo gallery of the event can be view by clicking here. In the weeks following the PVC Coaches Luncheon, both football and women’s volleyball proceeded to capture Ivy League Championships, while field hockey posted two NCAA postseason victories to earn a sport in the NCAA Final Four. The PVC Winter Coaches Luncheon is scheduled for Tuesday February 21, 2017. Next: Thank You for Your TAGD Support…21 New Lifetime Members!